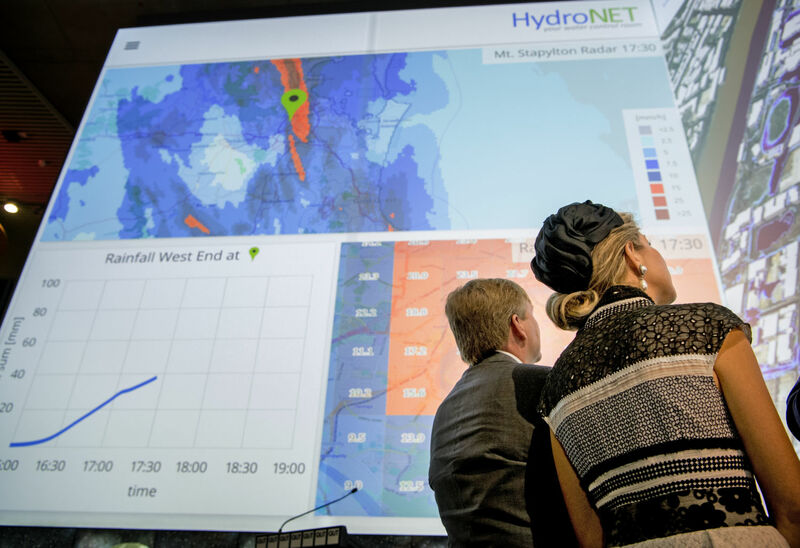 At the Water Day in Brisbane, Australia, Friday November 4th, Dutch King Willem Alexander and Queen Maxima have officially launched the Smart Scanner for Water Resilient Cities including the HydroNET Water Control Room. These tools support urban water managers taking the right decisions for effective water and flood risk management as driver for building resilient cities and communities. Climate change forces major cities worldwide to deal with flooding because of more frequent and intense rainfall. Many communities within Australia are impacted by flooding. As extreme weather increasingly becomes the new ‘normal’ the need for timely and location specific water management solutions becomes more significant. Making the right water management and emergency response decisions are central to making cities and communities more resilient to climate change and the impacts associated with extreme weather events. The use of smart IT solutions that include easy access to ‘real-time’ weather, climate and water data and rapid automated analysis and reporting, is becoming more important. After several years of cooperation with Australian Water Managers, HydroNET and Deltares have collaborated to launch the Smart Scanner for Water Resilient Cities. The smart scanner allows urban water managers to analyse, monitor and forecast historical and current (flash) flood events and allows them to analyse the economic and hydrological impact of measures to make their city more water and climate resilient. Via the RainWatch applications HydroNET provides the scanner with real-time access to the best available weather and climate information from the Bureau of Meteorology. The scanner uses this information to calculate flood scenarios with a basic hydrodynamic model and gives insight into the effects of a number of promising solutions to build understanding of the water system. Furthermore, the scanner helps to identify shared visions and potential conflicts of interest across stakeholders and facilitates discussion and collaboration. Via the Water Control Room of HydroNET the results of the scanner (in terms of reduction of floods and social/economic damage) are presented on dashboards.